Write a personal journal to record your language goals and efforts, to chart your progress, and to capture your observations of cultural differences. There are lots of ways to do this. Since I like to keep my journals as a record of my day-to-day thoughts and progress, I love to use a hard bound archival quality book. My favorite brand is Paperblanks since they offer many artistic covers and they clasp shut either with a magnatized wrap-around cover or an attached elastic band. If you prefer something less ornate, Living Oak Journals also make high quality personal journals. Here is the Living Oak journal that I kept while traveling in France. I like these journals because they have a sewn binding that allows them to lie flat when open. In this electronic age, it may seem old-fashioned to keep a travel diary on paper. But when I travel, I find that paper has many benefits. The biggest benefit is that paper and pen can be used anywhere-on the train, on the plane, in a hotel room, or deep in the bush. I never have to worry about laptop batteries failing or bring the correct AC/DC current adaptor, and they never need service that I can't perform with a little glue or tape. They are light weight, durable, and easy to carry, and best of all, journals are not a common target for thieves (unlike laptop computers or iPads). I've often pulled out my journal while waiting in an airport or while traveling on a train. I can snap my journal shut and stow it in my bag in seconds since I never know how long the wait will be. I recollect traveling on a train in Italy, each time the train would pull in to a station, we'd scan the platform for the name of the town. If it was the town we needed, we had only a minute or two to grab our bags and debark, not enough time to shut down a laptop, wrap up the cords, and carefully place it in its travel bag. Additionally, using a high quality journal gives me a keepsake that I can look back on years later. I've found that my languages--like my muscles--get weak with lack of use. Having a record of what I once knew serves as a quick reminder of words and phrases I've already learned. This is especially important when an old friend writes a letter and I have to brush up my language skills to respond. Of course, if you prefer an electronic medium, and you have reliable access to electricity, there are lots of ways to keep your personal journal using a computer. One way I have done this is through email; this is helpful if you feel pressed for time. While abroad, I send regular emails to family and friends. If you choose one person to regularly update about your language progress, and copy yourself on these messages, voila, you have a record of your language experiences abroad. On their most recent trip to Europe Terry and Ann posted updates to a blog to record their experiences. Many companies specialize in creating a book out of your blog so that after your trip, you can create a memorable keepsake of your experiences. When writing in a high quality journal, it is always nice to have a high quality pen for the job. I recommend keeping a running list of words and phrases as you learn them -- to chronicle your progress, remind you of words you later forget, and cheer you up when you occasionally get stuck on a learning plateau. An easy way to get started keeping notes about your language learning is to download the Walkabout Language Learning Action Guide. It is an easy-to-use manual that helps you discover your language learning dreams and then achieve them. You'll be able to rate your current ability and make notes as you progress. Click here to download it now. A journal can help you to clarify your goals and will allow you to write about your achievements as well as your ideas. This allows you to see the steps that you have taken towards your goal and will allow you to see where you stand as well as how much further you have to go to complete your goals. Your goals may be simple tasks in life or they may be life goals that will take more time to achieve. Whatever goals you set for yourself, be sure that they are attainable and easily documented in your journal. If you are pressed for time, preserve your experiences through letter writting (email works well too). 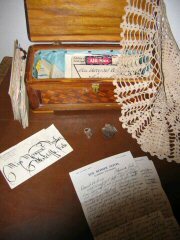 Pictured below are letters my grandfather wrote while courting my grandmother in 1938-39.